Mr. Foreman graduated from the University of Illinois with a Bachelor of Arts degree in Psychology in 1962. He obtained his doctor of law degree from DePaul University College of Law in 1965. Mr. Forman is an experienced mediator, having completed the Center for Conflict Resolution's 40-hour Performance Base Mediation Skills Training and having qualified under Amended Rule 20 of the Circuit Court of Cook County as a qualified mediator. Mr. Forman's ore than forty-eight years of litigation experience ensure that each client received the finest legal services. Mr. Forman has an expertise in Medical Malpractice, Personal Injury, Probate matters, Breach of Contract, Nursing Home Liability, Workers' compensation, Bankruptcy, and General Litigation. 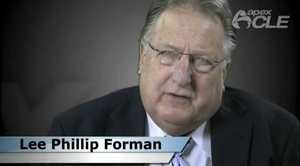 Mr. Forman has accumulated numerous Honors and Awards in his professional career: American Arbitration Association Arbitrator, Circuit Court of Cook County and DuPage County Mandatory Arbitrator, State of Illinois Tenured Teacher Dismissal Hearing Officer, State of Illinois Tenured Teacher Dismissal Hearing Officer, State of Illinois Appellate Hearing Officer in Special Education, Qualified under Rule 20 Circuit Court of Cook County by Certification at Centers for Conflict Resolution.